Welcome to this 4th episode of our Russian Made Easy podcast. If you’re just joining me, please know that the episodes are cumulative. Each one builds on the material learned in all the previous episodes, so it’s assumed you’ve mastered everything in those earlier ones. Let’s let that float around in your subconscious for a bit while we review the material from Podcast #3. I’m an American. He’s an Australian. Я – американец. Он – австралиец. I’m an American. She’s an Australian. Я – американка. Она – австралийка. Say: My mom is an Englishwoman. My dad is a Canadian. Ask: Your mom is an American, yes? Your dad is an Englishman? Tell someone: This is my friend. He is an American. Это мой друг. Он – американец. This is my female friend. She is a Canadian. Это моя подруга. Она – канадка. And since we’re reviewing, what was that tricky sound I had you pronounce at the start of this podcast? Excellent. OK..Then let’s add an “st” sound to that, ready? NOTE: You might notice a slight “f” sound in there, directly before the “st” sound. This is because I asked the speakers to sound out the whole word. But when spoken at normal speeds by a native speaker, the “f” sound is dropped. We’ll come back to the rest of this word a bit later. Right now, I’d like to work with introductions. In other words, “What do they call you?” But again, literally: How….you….they call? And our answer was: Меня зовут Стив. Try it with your own name. I’ll pretend my name is John. Your Russian friends, though, will have trouble saying the American version of Sarah. They’ll call you Сара instead of Sarah. Or: Марк instead of Mark, and so on. Just a heads up, there. So, let’s try a back ‘n’ forth with these. How do you ask a Russian person his name? You just asked him his name, now listen how he asks you the same question. My name’s Steve. And what’s your name? “a” doesn’t MEAN “and”…they have a different word for that in Russian. That’s just how it’s functioning here. Do you recall that bit of a Russian word we started learning earlier in this podcast? It started with a “z”? Once again, most courses will tell you that здравствуйте means Hello. здравствуйте is a formal greeting you’d use with strangers, co-workers, your elders, your boss, and so on. You’d also use it when greeting two or more people at the same time. There’s an informal version of this greeting that we’ll learn some other time. For now, it’s best to just practice this version. Let’s try to put all this together. Imagine you’ve just arrived to Moscow, and your friend has met you in the airport. There’s a man with her, and he sticks out his hand to shake yours. How will he greet you? And how do they call you? This is my friend Robby. Add: He is a musician. Say, He is an Englishman. This is my friend Veronica. I’d like to take a minute to share a great tip for maximizing your study time. This is gonna sound old school, and it is, but that doesn’t make it any less powerful. I’m talking about flashcards. It’s nearly blasphemy in this digital age to talk about something so analog as flashcards, but trust me, you’ll want to start making them if you haven’t already. One card for each word, and main construction you learn. I usually buy those blank recipe cards, and cut them in half. On one side, write the English word, and on the other side, the Russian version. Be sure to include the SLT, too. And when you study your cards — this is important — make a small X in the corner each time you get it wrong. This let’s you quickly see which ones you need more work with. Another tip is, if you can’t remember the answer, don’t give in and read it. Instead, cover up the answer and reveal just the first letter. See if that jogs your memory. An important rule in developing your memory is the smaller the hint, the better. And a final tip: Assuming you continue on and learn to read and write in Cyrillic, be sure to go through all your cards and add the Cyrillic version for every word. Again, this is an important part of learning a language…to physically write things down. So, if you want to just tell people you’re learning Russian, by all means, download some flashcard apps and show them to all your friends. But if you actually want to learn to speak Russian, and do so in an organized and efficient manner, I highly recommend making flashcards. Alright…my flashcard rant is over. Let’s end with a cumulative review of the first four episodes of this podcast. Ready? What’s the Russian word we use to greet people? Say: This is my mom. She is a doctor. Это моя мама. Она – доктор. This is my dad. He’s a businessman. Это мой папа. Он – бизнесмен. In this next one we’ll use that “ah” sound we learned earlier, this time to convey the word “whereas”. Dad is an American, whereas mom is an Australian. Папа американец, а мама – австралийка. Say: This is my friend, Pavel. He is a student. Это мой друг Павел. Он – студент. This is my friend Katya. She is an engineer. Это моя подруга Катя. Она – инженер. One more time, we greet people with what word? Ask: And what’s your name? In the next podcast we’ll learn our first question words in Russian. Very useful. And I’ll tell you the trick that memory experts use to remember tons of new words. And as always, head over to http://russianmadeeasy.com/ to download a transcript of this podcast plus all the exercises from today. I’ll see you next time! Your podcast is really helpful, lucky I stumbled upon it. I’m learning faster than I thought I would. Excellent podcasts – I’ve been studying Russian for about a year, and your course is the most helpful one I’ve found so far. Thanks and keep up the great work! I had a question regarding the “learning to read Cyrillic” link you mentioned that you’d include at the end of the transcript. I can not seem to find it on this page. If it still exists, would it be possible to have the link? I’m incredibly interested in the lesson/s. Thanks, Jae. The podcast is indeed free for the forseeable future. It acts as a prier for my online video course (Russian Accelerator). That we have to charge for. I just wanted to reply to your query as to whether this has been a good pace or not. I think it’s been really nice, fast enough that I’m getting enough vocab and not feel like I’m slacking, but slow enough that I don’t feel overwhelmed. I can always listen to a couple podcasts in a row if I’m feeling particularly ambitious, anyway. Thanks for the feedback. Glad the pace works for you. Please let me know how you do on the final exam (podcast #30)! Thanks for your lessons and especially for the tips-of-the-day. Although the lessons per se are not that useful for me because I’m Russian, but I’m now trying to use your method for learning Spanish. Yes, most of the techniques I use in the podcast can be applied to learning other languages. Your English is great, so I’m sure you’ll do very well in Spanish, too. I been writing but the idea of the flashcard i like it I will do that and review all 4 previews episode. I would suggest learning to write the print version (block letters) of Cyrillic first. Newspapers, books, websites, SMS msgs…they all use that form. Later, after you’ve mastered it, you can move on to the more challenging script. I don’t know HOW I happened to find your program but I find it very interesting. In the 1950s after the Russians launched their Sputnik satellite there were many classes offered in Russian in colleges in Southern California. Because only the top universities had well educated Russian Instructors the instructor for my two years of study was very basic in his language and instructional skills. It was like two years in the Gulag and I eventually dropped my study of Russian. I think your program may have renew my interest. Although I am now 80 years old, I still enjoy studying and I think I still have my interest in the Russian Language. Thank you for designing this program. Spasibo, James! Sputnik, of course, is the Russian word for ‘satelite’. 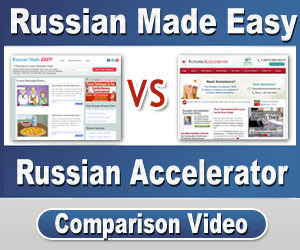 I hope you’ll check out Russian Accelerator. It’s my online, video course. Thank you for your method of teaching Russian easily . It is really useful and I did learnt a lot. you really went to town . I tried to download the episodes but , I could not. Have a super nice time and keep using your method for teaching. Abbas Vaneshani from Tehran Iran. Hmm…Can you tell me the page you were having trouble with? Excellent pacing and you have the lessons individualized by posting the short exercises for reviewing. I am having trouble with the second half of zdrast. The word is unfamiliar and I know I am not saying it correctly . Hope the entire word is written out in English. As a beginner I am not hearing the second part of what to say after zdrast. Appreciate your amazing podcasts. Either is fine…just say it FAST. I really thank you for your great work. These podcasts help me a lot. Methods you follow is quite efficient and facilitates learning. I found you while i was trying to find an app for learning reading Russian alphabet. I also thank you for your work and effort. It seems very easy to understand. By the way my native language is Turkish:) Instead of following Turkish online courses, i am following your podcasts. By the time i finish all the courses i would give you a feedback again. I hope to welcome you to my Russian Accelerator course one day. I have tried a few other websites, apps and videos to help me learn russian and this one is by far the most helpful and easy to learn. When i listen to the podcasts i take notes to help me spell out each word in russian and that really helps me to remember everything. Yes, writing things down is definitely a great way to reinforce what you learn. It makes it tacticleThere are actually studies proving the efficacy of handwritten flashcards. Hope to see you in my Russian Accelerator course! Thanks for your all your help! Wow, William…Thanks so much. What’s great is how persistent you’ve been, through all of the other disappointing courses you’ve tried. Looking forward to hearing how you do in the podcast, and to welcoming you to Russian Accelerato. Until then, keep up the great wrok. I’m pretty young but this still helps me try to learn how to speak Russian. Thank you so much! This is the best Russian material I have ever seen. Great content mate! Glad you’re enjoying my podcast.